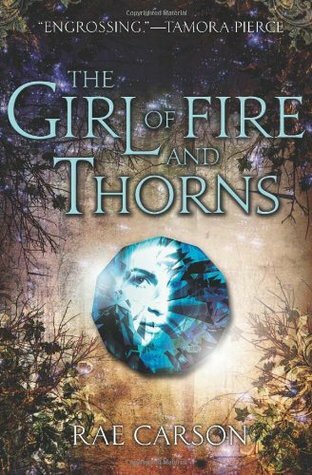 My Thoughts: When I first heard of The Girl Of Fire and Thorns, I thought it sounded interesting, but not really my type of read. I honestly didn’t know if I would enjoy it. We are introduced to Elisa who on her 16th birthday is moved to a new kingdom, in a new city, to become the wife of a king. Her father arranged a marriage for her to the King in exchange for sending the King troops to aid in the war against rebels. The King doesn’t really want Elisa, not in the wife kind of way. He suggests that they be “friends” and she help him with his war tactics. Elisa is a hefty girl and she feels like nobody can really take her seriously because first they see her image, and not her mind. At first it was hard for me to really like Elisa, but she did grow on me and I began to relate to her and even want her to be a stronger women. Elisa thought herself fat and others thought of her as a pig and lazy. Yes, she did enjoy her food but she was so much more than that. Elisa gets kidnapped and starts to see things from another point of view. One thing we can’t forget is Elisa holds the mark of the Godstone, which comes only once every century. This is a high honor. Some people are enticed by it, while others want to kill her for it. Even though Elisa doesn’t have feelings for her husband, she does have feelings for another guy. This relationships develops quickly but nicely. I devoured the scenes between the two. All the side characters are also amazing. Each one had such a distinguished personality and it was easy to know who was who. From her enemies to her allies, they were all magnificent characters. By the end of the novel, I felt Elisa was a brave and honorable person, she is fit to be Queen. She looks at the bigger picture and doesn’t give up. The Girl Of Fire And Thorns was pretty good. I enjoyed it, even though it is something I usually do not read, and it is kind of long. It is kind of a historical type book, which I tend to stay away from. It's also fantasy. Overall: Carson’s writing is beautiful. The way things are described makes you really feel like you are there. I felt like I was experiencing Elisa’s feelings and even in events such as the sandstorm, I felt like I was being covered in sand. Cover: I don’t know how I really feel about the cover. I don’t love, but I don’t hate it. It’s alright. When I just saw the cover I was thinking the same thing. Don't necessarily hate it but don't like it either. It doesn't sound like something I would usually read but after reading your review I think it would be worth giving it a try so I am going to add it to my tbr. Thanks for the great review. Glad you ended up liking it. I didn't think this book sounded like something I'd like either and then I was blown away. Can't wait for the second book!